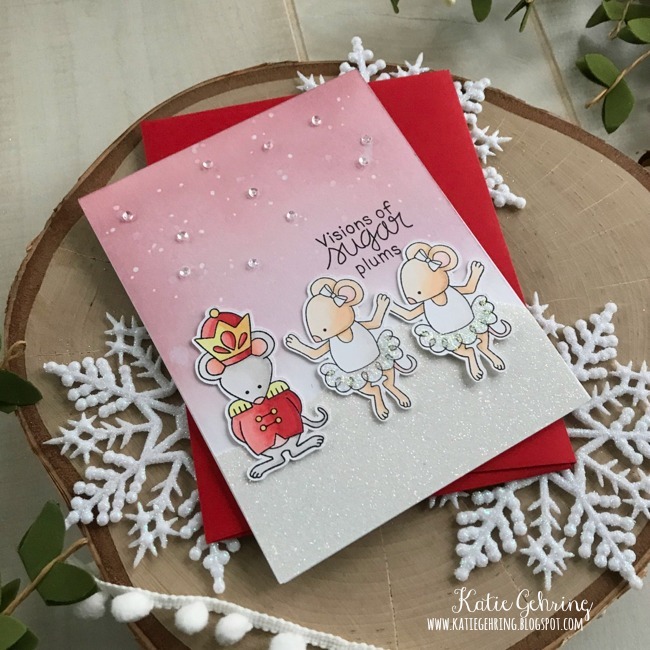 stamping lightly: Deck the Halls with Inky Paws Hop! Deck the Halls with Inky Paws Hop! 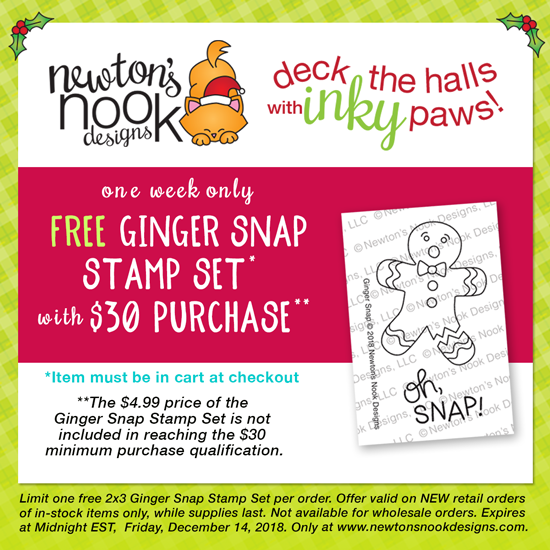 I am back with Newton's Nook Designs today celebrating the "Deck the Halls with Inky Paws" Blog Hop! 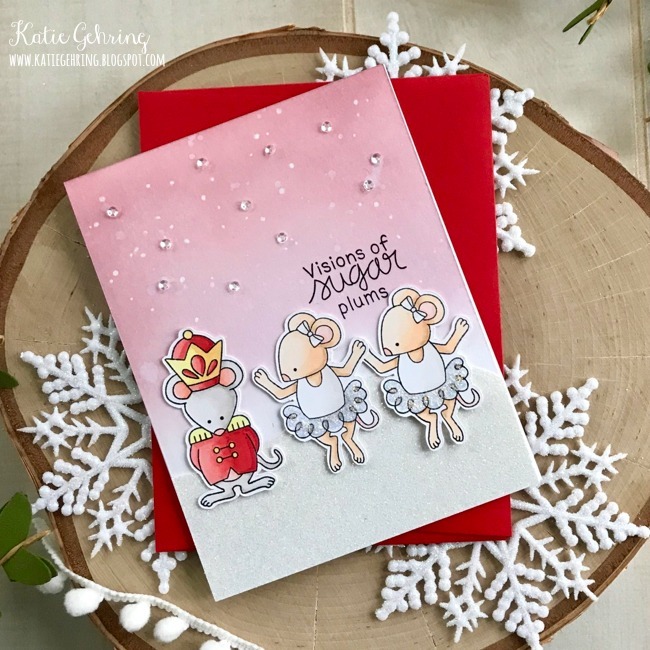 I have another card to share featuring The Nutcracker Squeak stamp set. This time, I am focusing on the adorable ballerina and Nutcracker prince mice. I used Distress Oxide inks to create the background and spattered it with water lifting the excess ink with a paper towel. I adhered several tiny sequins to the background to mimic the look of snowflakes softly falling onto the scene below. I stamped and colored the images with Copic markers and arranged them onto a snow drift of glitter cardstock that I free-hand cut with scissors. I added clear glitter Stickles to the ballerina tutus to add some additional sparkle. My final step was to stamp the sentiment with black ink. We will be choosing two lucky winners to win a $25 store credit for Newton's Nook Designs online shop! To enter, just leave comments on the Design Team Member and Guest blogs (see list below)! Two winners will be chosen at random from the collective blogs in the blog hop. Make sure to check out each of their blogs and comment for your chance to win. You will not know which blog has been chosen so the more you comment on the better your chances are of winning! You have until Sunday, December 9th at 9 pm EST to comment -- winners will be announced on the NND blog on Monday, December 10th. Big thanks to Jen and Jeff from Newton's Nook for inviting me to join in the fun! Love this beautiful and sweet card with a bit of magic, sparkle and holiday cheer!!! Love the soft glitter cardstock you've used below the images, it pairs perfectly with your pink background and ballerinas! ohh that shimmer! it is such a pretty and festive card! I love the little gems too! What an adorable card! Love all of the sparkle! I can't stand how cute this is. The soft colors go wonderfully with the cute ballerinas. Lovely card! Wow! What a beautiful card!!! Amazing colouring!!! Such a pink dreamy card! Loving it! Happy Holidays to you and yours! This is so sweet! I love the cute little mice in white and silver with the pink sky behind them! Adorable! Very soft & pretty - I especially like the look the tiny sequins add to the card - I thought they were little crystals! Hope you and your loved ones are having a wonderful holiday season! cute characters and love the background and the sparkle. Great design - very fun and sweet! Like the cute Nutcracker scene you created. Like the coloring. These are soooooo cute! I love the little ballerinas and the scene you created with the sparkles! Dance of the sugar plum fairies. This is adorable! I love the Nutcracker...so sweet! Cheers. Your card is awesome! It makes me smile! Your thoughts mean so much to me. Thank you so much for taking the time to let me know you stopped by! Hi! I am Katie. By day, I am a working mom of 2 awesome girls, and by night, I am a paper engineer, DIY enthusiast and all around crafty gal. I love to try new things and strive to do something creative each and every day. Waffle Flower New Release Blog Hop! Avery Elle Spring 2019 Blog Hop!